Tewinkle Park is a great neighborhood park in Costa Mesa behind the Orange County Fairgrounds. From Fairview turn east on Arlington toward the fairgrounds, pass the shuttle parking and the athletic field. When you see the little lakes on the left and the stables on the right turn left onto the little street bordering the park. There is a small parking lot and parking on the street. Click here for a map. Although this is a neighborhood park and not a "nature area," it has appeared in the OC Rare Bird Alert 34 times so far for: Hooded Mergansers, a Eurasian Wigeon, Yellow-throated Warbler, Pine Warbler , Plumbeous Vireo, Common Golden Eyes, and a Ross's Goose. And it's not just rare birds that hang out here. 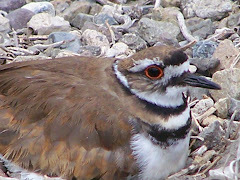 So why do birds come here, and why does this park show up so often in the OC Rare Bird Alert? Well, there are several waterfalls and lakes or ponds stocked with fish. There are nice lawns. And finally lots of trees including pine trees and Eucalyptus trees. It is a great place for birds to rest, drink, swim, fish, and eat insects in the grass and trees. It is also near a sports field and the Orange County Fair Grounds which provide a lot of habitat for birds to choose from. It has food of various kinds, water, and shelter. 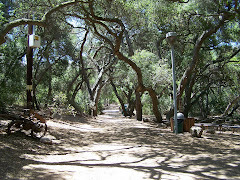 Many community parks like Tewinkle have wonderful surprises waiting to be discovered. 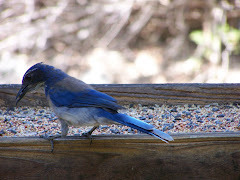 It isn't always a nature center or wilderness area that has good birding. 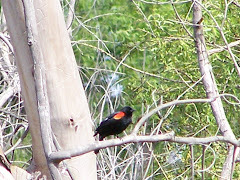 Sometimes you can have great birding moments in a quiet community park. Just a few of the many ducks at Tewinkle. Recently, I went to Tewinkle Park for a quick walk just to see what I might find there. 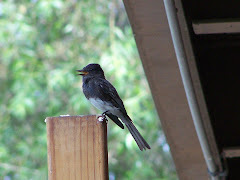 After all, it has been mentioned in the Rare Bird Alert several times. It had been years since I had been there. I parked on the side street and walked toward the bridge. The park had a lot of quacking ducks happily swimming and wiggling their tails and flapping their wings. Very peaceful. As I walked onto the first bridge, a huge bird with buffy markings on the wing linings dive-bombed into the water from a Eucalyptus tree over head. I must have jumped back. And I wasn't the only one startled by this commotion. Ducks scattered, quacking at full volume and flapping loudly over the surface of the water. The bird had a wingspan was over 5 feet, and splashing by us that closely, it looked huge. The underside of the wings was a kind of buffy color. It almost looked hawk-like in color, but it acted like no hawk I'd ever seen. It had splashed into the water like a enormous tern right near a Hispanic family. They had leaped back and begun discussing what it could be in rapid Spanish. By the time I got to that part of the bridge, it had disappeared. All was again quiet and calm. Then suddenly it dove again from the branches above like some feathery kamikaze, bomb diving loudly into the water--which was again full of Mallards, Wigeons, and Coots. As it flew up again, I kept it in sight. Perched up in the Eucalyptus tree was a large black-and-white bird with buffy wing linings that were not yet the pure-white linings its adult feathers would be. Its youth was also revealed in the white edging on the back feathers which gives it a scaly appearance. It was a juvenile Osprey. Even as young as it was, it was an awesome bird of prey. Although not a rare bird, an Osprey was the last bird I expected to see that day at Tewinkle Park that day. But then, there are fish in the water. And they do love fish. In fact, fish are pretty much all an Osprey eats. Osprey looking between ducks for fish in the pond below. It sat among the branches in the Eucalyptus watching for a long time. It never tried for fish again. Then it flew from one Eucalyptus into the one I was standing below and looked down at me. I figured turnabout was fair play. Tewinkle Park is on Arlington and across Arlington from the park is the stables. So there is a horsey smell in parts of the park, and you can hear the stabled horses neighing across the street. The Osprey scanned the lake below, and reacted to the sounds around him like the ducks and the horses, and the people. He was very big and easy to spot. The young Osprey stayed looking over the little park lake for a long time. Then he flew briefly into a pine tree, seemed to grow restless, and flew away. See the video below. I walked across the bridges and up the hill. The pines were full of little warblers and sparrows flitting quickly from branch to branch. 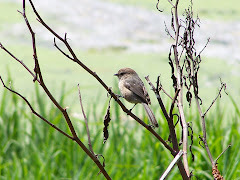 I saw Black Phoebes perched on rocks by the water and on pine tree limbs. There were about 6 or so Egyptian Geese at Tewinkle that day. Egyptian Geese in Orange County and Los Angeles County are probably escapees and descendants of escapees. They are somewhere in size between a duck and a goose. Their long legs and necks are more goose-like than duck-like. They move slowly and with grace. I first saw an Egyptian Goose in the 1980s at Huntington Central Park West at the lake. That day, they added to the general slow, calm pace that was interrupted by the fishing Osprey. Mallards and American Wigeons. Mallards quack; Wigeons whistle. As the ducks took their baths, splashing around in the water, and the quacks and whistles of the Mallards and American Wigeons filled the air, it felt peaceful and quiet despite the street sounds. While the Egyptian Geese slept or posed, the American Coots fed in the grass or swam among the ducks. The relaxing sound of the little waterfalls made the atmosphere restful and refreshing. What a wonderful time I had had. I had wanted to see an Osprey up close and my prayers had been answered. I was grateful for the chance to see one so close for so long. What a good day. With a smile on my lips, I returned to the car and went home with my memory card full of Osprey photos and clips. See related post Osprey--Pandion haliaetus about Ospreys. There are currently about 8 baby gosling Egyptian Geese at this park!! They are precious. Three Egyptian Goslings hatched in late February this year at Tewinkle. Unfortunately two were killed (one by a dog that the owner lost control of ) before the remaining one and her parents appear to have left, just weeks ago. Beautiful birds.